I love my Olympus E-500! I need to learn more on how to use it, but other then that, it does a great job. My E-500 is GREAT! I'm on pace with Linda in usage and have had no problems either. I'm enjoying the photographic freedom it has given me so much! Love it. I think the E500 is very nice. I use it a lot for indoor and outdoor it just works good. I'm also an E-500 user....... terrific camera, great quality lenses and very dependable. I have passed the 30,000 photo mark and not 1 problem!!!! 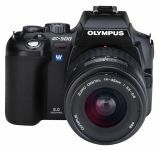 Olympus had learned her lessons from the E-300 and implemented them sucessfuly. i'm enjoying every moment i'm using her.